According to a recent report from the U.S. Centers for Disease Control and Prevention, fewer U.S. children are dying in car crashes with death rates falling by 43 percent from 2002 to 2011. Health officials say the increased use of car seats and booster seats drove the decline, still, one-third of the children 12 and under who died in 2011 were not buckled up. “The first step is buckling up. Every child, of every age, on every trip,” said Dr. Frieden. Last month, the National Highway Traffic Safety Administration proposed new regulations to better protect kids in car seats from side-impact crashes. Health officials urge parents to keep all children 12 and under in the back seat, and use car seats and booster seats until seat belts fit properly and recommend that car seats face the rear up to age 2. • Always use an infant car seat, booster seat, or seat belt to secure your child. • Always ensure that the type of car seat you choose is the correct size for your child. 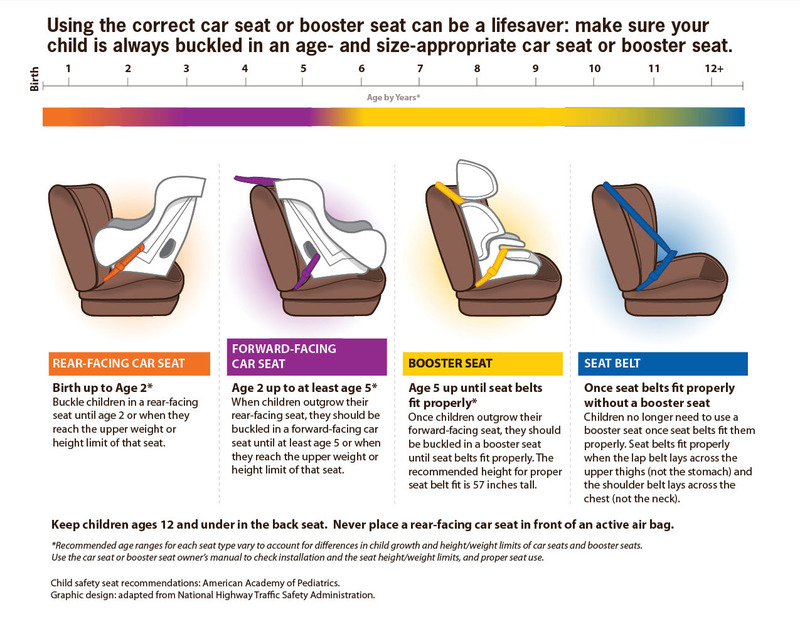 • Make sure your car seat or booster seat is properly assembled and installed according to the seat’s owner’s manual or get help installing them from a certified Child Passenger Safety Technician. • If your child walks to school, make sure that he or she knows the rules of the road and follows them (reiterate that they should always cross the street only in marked crosswalks and in accordance with crossing signals, if applicable). • Buckle all children aged 12 and under in the back seat. Airbags can kill young children riding in the front seat. Never place a rear-facing car seat in front of an air bag. • Buckle children in car seats, booster seats, or seat belts on every trip, no matter how short. • Set a good example by always using a seat belt themselves.